Plan your party at Busaba! Do you have your birthday coming up? Or planning your best friend’s hen do? Or your annual business meeting? We have the perfect private dining spaces for you at 6 Busaba locations! Spread across London; Shoreditch, The O2, Covent Garden, Bloomsbury, Stratford and St Albans, there is a Busaba always close to you! Even better, we have 2 brand new private hire spaces coming up in the heart of West End in Summer 2017! Perfect for groups from 8 to 50, we help you create your bespoke event with our group menus and drinks bundles; take advantage of our PA systems and even decorate the space to your liking. 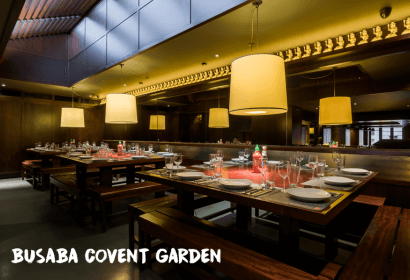 Busaba Covent Garden: Up to 38 people, group menus and drinks bundles available. Busaba Shoreditch: Up to 48 people. PA system, screen and projector available. Busaba Stratford: Up to 30 people, complete private room, PA system, screen and projector available. Get in touch now and organise your party!